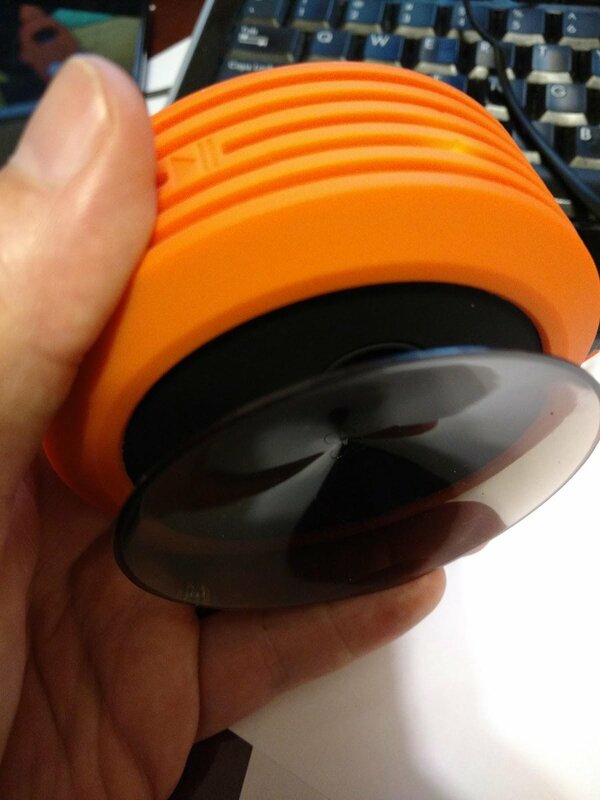 I recently received the MPOW Buckler Bluetooth Waterproof Portable Speaker. Approximately the size of a donut, the device comes equipped with suction cup on the back for mounting in the shower, as well as a tiny little caribiner and handle that allows you to attach the speaker to a backpack, tent, or other location you see fit. Connecting the device was pretty straight forward, just turn it on and your phone, computer, or other bluetooth device will quickly see the speaker and allow you to connect. I will admit, I did have some difficulty connecting to my Chromebook. Despite it already being connected and playing the music, it kept giving me a message to connect. I did not have these issues with my Nexus 6P. I also did have some issues with changing the volume from the speaker. It seems to have a delay so I did not think the volume was adjusting when it actually was. Despite these minor issues, the speaker put out a quality balanced sound, not too much bass and not too much treble. I was also impressed by how loud the speaker could get without distorting the music. As mentioned, this is a waterproof device, so it can be used in the shower, on the boat, out camping, or hanging by the pool. Overall, at a price of $21.99 I think this is a great deal and I would recommend this to anyone looking for a portable waterproof bluetooth speaker. I was provided a free Mpow Buckler Speaker for testing and review and was asked only to give my honest review. Still have it, but really only used it for the review. Mine only last a handful of months with lite use. Great share....In the event that you were pondering what a portion of the best Bluetooth speakers for the shower are, don't stress we got you secured. Sing your little heart out. Which Bluetooth Speaker is the Best? There are various types of Bluetooth speakers accessible in the market, yet in the event that one will buy a speaker. The Pulse Bluetooth shower speaker is close to the highest point of our best shower speakers for when cleaning up. Highlighting an extremely sensible offering value, it for all intents and purposes incorporates each one of the choices and highlights you could conceivably need from this sort of contraption.